Split dozens of PDF files with batch process. Split different content pages to different PDF files. Pages with the same content remain in one PDF file. VeryPDF PDF Content Splitter for Mac is developed to split PDF files by the text content in specified position of PDF page in Mac OS X. It can split continuous pages that have different text in the given position into different PDF files. Meanwhile, it supports option to split PDF pages that have the same text content in the specified position. Given the position in the PDF page, VeryPDF PDF Content Splitter for Mac can search and compare the text in the position of all PDF pages, and then split the pages that have different text in the position to different PDF files. VeryPDF PDF Content Splitter for Mac supports an option to group even separated PDF pages having the same content in the given position to continuous pages in one single PDF file. This option is useful for categorizing PDF pages that have the same text in the specified position. 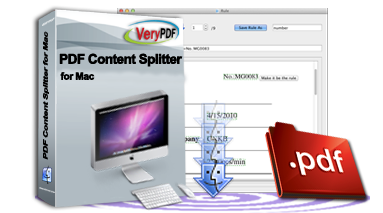 VeryPDF PDF Content Splitter for Mac split PDF files based on splitting rules. If you have a large number of PDF files that will be split with the same rule, you can split them one time with a simple batch process. It is much time saving for busy business work. Support all PDF format versions from 1.0 to 1.7. Deal with dozens of PDF files with batch process. 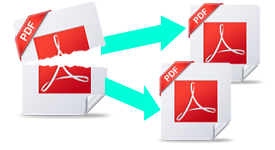 Split PDF files by the content in specified position. 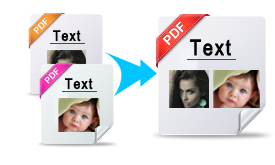 Leave PDF pages containing different text in given position, to separate PDF files. Split two continuous pages having different text in the position to two PDF files. Group separated PDF pages that having the same text in given position to one PDF file. Save any number of rules for splitting.